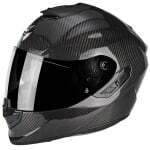 The Scorpion Exo 1400 Carbon Air incorporates the Airfit concept. Airfit permits a rider to personalise the helmet fit through air adjustable cheek pads with additional noise reduction. It is Pinlock MaxVision ready (insert included), fitting perfectly into the especially depressed area of the visor. An internal retractable sun visor is included that eases eye strain instantly in varying light conditions without changing visors. Also featuring the KwikWick3 lining which is very effective, hypoallergenic, removable, machine washable, very soft and pleasant to the touch. 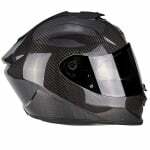 Extremely light, the TCT shell structure provides a level of protection as yet unseen in the world of helmets. This smart shell is able to gradually crumple on impact, which allows it to absorb most of the energy generated by the shock, while retaining one of the strongest structures. 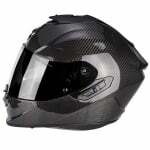 Scorpion Exo is a relatively new addition to the plethora of motorcycle helmet brands available in Europe but they have most certainly hit the ground running. From their European base in Strasbourg, France, Scorpion have developed some of the most technical elements found on motorcycle helmets today, that have since become commonplace on the feature lists of the biggest brand names. A form of Scorpion's own Airfit pump system can now be found on models of both Shark and HJC helmets but it was Scorpion Exo who pioneered the technology, along with other innovations such as their Kwikwick liner system. The Scorpion helmet range, whilst focusing on technological advancements, also focuses on the more core expectations of today's biking fraternity, style, quality and fit. To that end, they've hired some of the most famous names in motorcycle helmet design and are able to control their entire production process, by manufacturing all elements of the helmet themselves, in their own production facilities. Scorpion say that their philosophy behind every single helmet they produce can be summarized in five words: protection, aesthetics, dynamism, comfort and innovation. We say, that over the next few years, Scorpion helmets will continue to grow in popularity throughout Europe and will undoubtedly take their place alongside the other major brands of motorcycle helmet. The weight of this helmet is 1200grams. Does a Pinlock Insert and Dark visor come with all 3 colour variants? A Pinlock insert and dark visor are included with the Pure Red and Pure Yellow variants. I have read that it is best go up a size with Scorpion helmets. I usually wear a 60cm large, would I have to go to an XL ? It depends entirely on your head shape. If you are on the UK mainland, you can take advantage of our free returns service and try the helmet on in the comfort of your own home. 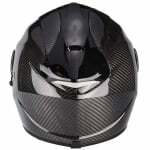 As long as the item still has tags attached and the visor strip fitted (ie is an new condition) then we could exchange the size for you if needed.